AUCKLAND, New Zealand - George Suri has heaped praise on Auckland City FC's performance as the Navy Blues set-up an all-Kiwi semi-final clash in the OFC Champions League. 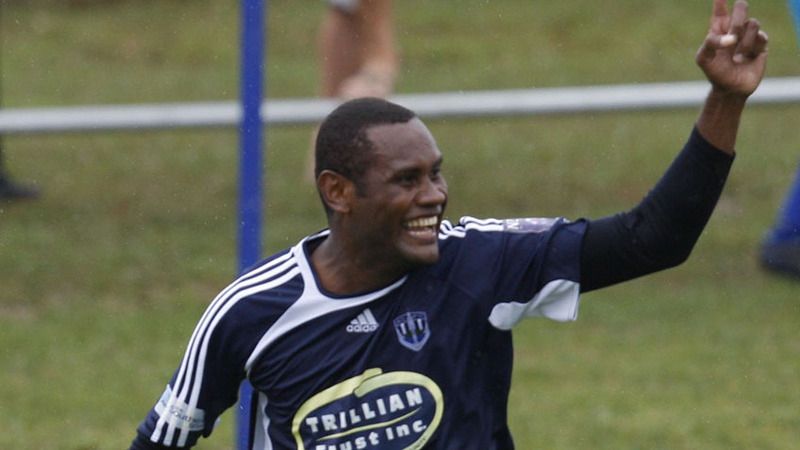 The former Navy Blues and Solomon Islands international returned to Kiwitea Street for the first time since helping guide Auckland City FC to the 2008-09 OFC Champions League title. Suri, now 35, was at the match following the fortunes of the Solomon Warriors as they tried to join fellow S-League rivals in the last four. Instead, Auckland City FC will face Team Wellington in the semi-finals, the fourth season in a row the teams will meet in this competition. With Emiliano Tade and compatriot Micah Lea'alafa both on the scoresheet, Suri said he enjoyed seeing the Navy Blues play a positive brand of football. "Its really good to be back at Kiwitea Street and see the young players that Ramon is bringing through. "They play some good football and they have that winning momentum that Auckland City FC have always had in the past," he said. Suri played 16 matches for Auckland City FC and scored three goals for the club including a late winner for the Navy Blues in a 1-0 victory over AS Manu Ura in the group stage in 2008. "I joined Auckland City FC in 2007-08 and it was a tough time because Waitakere United has just won the OFC Champions League and National League double the season before. "We were knocked out at the group stage in the Oceania competition then were beaten by Team Wellington in the NZFC semi-final playoff. "That was a crazy game and we lost 4-3 and had a player sent off and everything went wrong," he recalls. Suri's obvious highlight was picking up victory in the OFC Champions League the season after. "The best moment of all was winning the OFC Champions League in 2009 when we beat Koloale in Honiara 7-2," he said. Suri was subbed out of the first leg with an injury after Koloale took an early lead through Richard Anisua but the Navy Blues turned the game around with Keryn Jordan bagging a hat-trick. The mention of Jordan's name stirs memories in Suri and he also recalls former team-mate Commins Menapi, both men passing away in recent years. "Its sad Commins Menapi and Keryn Jordan have gone now. They were role models to a generation of kids back home and here in New Zealand and its very sad to see them pass away far too soon," he said. The burly centre-back returned to New Zealand in July 2017 and now lives in Tauranga with his family where he works as a kitchen fabricator. Suri says he is enjoying life back in the country that helped form his football career. "We came back to New Zealand in the middle of last year and have three children and I want them to get into football one day. "I'm not involved with football anymore because my family only just arrived in New Zealand in November and I'm settled down now taking care of them," he said. Suri won 19 caps for the Solomon Islands scoring one goal and was a key figure in his nation's FIFA World Cup playoff tilt against Australia in 2005. He won two OFC Champions League titles, one each with Auckland City FC and Waitakere United.